We're now over a month into our Iconic Encounters web series, so it's only natural that we'd get to Lini, the iconic gnome druid, sooner rather than later. This week's piece of flash fiction from James L. Sutter finds the intrepid adventurer alone in the Darklands with only her faithful companion, Droogami, to aid her in battling a sinister, fleshwarped foe. Lini ducked just as the spider-lady flung a gob of green acid. It spattered across Droogami’s fur instead, sending up a waft of sickly acrid smoke. The leopard snarled, contorting in pain. “Droo! Don’t bite it!” Lini closed her eyes, stretching out her mind-hands to feel for the big cat’s wound. There—a twisted, blackened feeling, like the trail of a summer wildfire. She reached out to the life around her, begging and borrowing from the mushrooms and water bugs of the strange cave, redirecting their shared energy. In her mind’s eye, she pictured rain pattering down across that forest scar, feeding dormant seeds, calling forth the first green shoots of regrowth. She opened her eyes. Where the acid had burned, the leopard’s flesh had healed to gray-pink scar tissue, already beginning to sprout fur. “Oh, hush! It’ll grow out!” Lini turned back just in time to dodge a swipe of the arachnid abomination’s claws. The fleshwarp shouted something in a language that sounded like snapping twigs, but that Lini was pretty sure wasn’t the language of twigs. If twigs could speak to anyone, Lini was fairly confident they’d talk to her, not this gross spider-lady. And she really was gross. Who’d ruin a perfectly good giant spider by fusing half an elf to it? Let alone a rude one like this. One of the spear-like spider legs shot out, catching Droogami in the chest and flinging the cat sideways against the wall. Droogami hissed and surged back to his feet. Definitely rude. Lini fell back toward the mushroom patch and reached for the green essence that flowed through nature. Not, like, literal green—everything growing in these caves was purple or glow-pink or fishbelly white. But it was all still part of the green within Lini, Droogami, and even the fleshwarped dark elf: the endless cycles of the natural world that bound all things. The things that grew down here might not match the hills and forests she was used to, but that didn’t matter. Being a druid meant finding the natural in everything. You took your forest with you. She reached out to all the little lives—the skittish minds of the crawlers and burrowers, the sleeping spirits of the fungus, the unseen parasites in their water-drop empires—and asked for help. They answered in a rush, vines bursting forth from nowhere to tangle the dark elf aberration’s legs. She screeched and fell sideways, slashing with her claws, but for every vine she severed three more took hold. She turned toward Lini, one fist wreathed in black flame. Droogami pounced, landing on the angry arachnid from above and driving her down into the writhing mass. The vines immediately wrapped him up as well—there was only so much discretion you could ask from a plant, magical or otherwise—but unlike the spider-lady, he had no interest in breaking free. As the vines bound them closer together, he snarled and took the dark elf’s neck in his mouth, biting down just hard enough to draw blood. The fleshwarp went still, flame winking out as she took the hint. “Sorry about his breath,” Lini observed in the language of elves. She picked her way closer, hopping from mushroom to mushroom. “I’ve tried to show him how to scrape his teeth with twigs, but he’s too stubborn. And you wouldn’t believe some of the things he’s eaten down here.” She wrinkled her nose. “Or maybe you would. I don’t know what you believe. That’s your business.” She seated herself cross-legged at the edge of the vines. Through the waving tendrils, the spider-lady watched the gnome with angry, unblinking eyes. Lini drew her scythe, tapping it thoughtfully against her cheek. If you liked this week's Iconic Encounter, you won't want to miss next week's exciting entry. Until then, Pathfinders, may your circle be unbroken! Who’d ruin a perfectly good giant spider by fusing half an elf to it? They answered in a rush, vines bursting forth from nowhere to tangle the dark elf aberration’s legs. Digging the art. A nice departure from the usual style. Seems plausible, though the PF2 version was always less powerful than the PF1 version. I like the story and Lini's attitude as displayed. That's really all I have to say about that. More art like this, please! 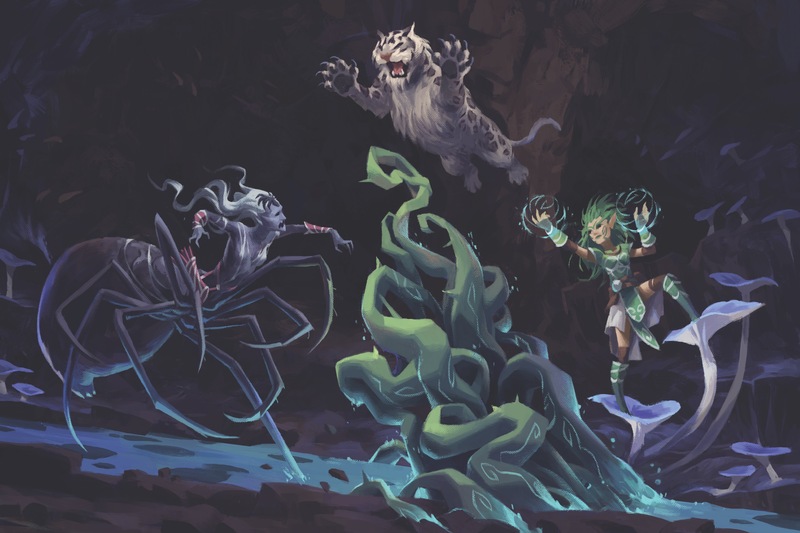 Yep, much like Lem's story, this one didn't seem to introduce anything we didn't already know about druids - they can have a pet, they can cast heal, and they can cast entangle. Though I wonder if that last bit was cast through Spell Points, assuming such is still a thing in PF2. he snarled and took the dark elf’s neck in his mouth, biting down just hard enough to draw blood. I am curious what the mechanic is here? Is the cat simply grappling and pinning? How does the cat know not to simply bite down? There's no combat direction given by Lini, is that meant to reflect the actual rules? One of the major challenges I've had in PFS is getting consensus on what Companions can and can't do. The Playtest was clearly not focused on fleshing out Tricks or the types of actions Companions could take. So I'm curious if this represents a real mechanic or just artistic license? 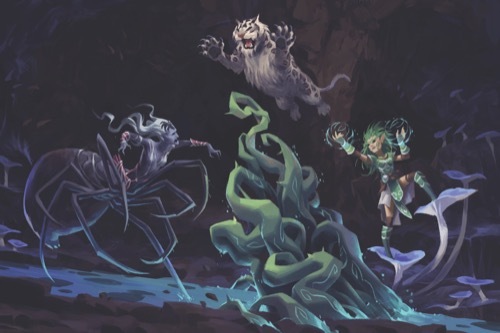 My guess is that the mechanic illustrated here is indeed the total number of actions a Druid and their pet get. Im curious if druids have some mechanic to call on power from nature. Both the art and the story detail her moving onto the mushrooms to be closer to nature and using their essence to empower her magic. 2) the leopard didn't kill the fleshwarp. PF1 doesn't have any Trick that tells an animal to subdue another creature and it certainly wasn't in the Playtest. I think some people here have been scrutinizing these stories for some hidden hints for mechanics in the final game more than is necessary and probably in vain to boot. The playtest itself arguably allowed for everything there. When you spend an action to give your companion actions you decide what those actions are. The entangle is a bit more of a GM call but I’d rule that a significant quantity of mushrooms would count as “plants” for the purposes of casting entangle. Yes technically fungi aren’t plants but that seems like splitting hairs for a fantasy setting. And even if those aren’t correct it is more than likely just a bit of fluff for storytelling’s sake. Sometimes a story is just a story. I guess nobody ever told Lini that healing in combat is usually suboptimal . . . . It's vastly less so in PF2. Single target healing has received such a vast boost in amount healed that it's actually able to keep up with damage in many cases, making it quite viable in some situations. Eh, now that treat wounds is a thing most of the healing spells are for combat. Though I admit that whether doing it is optimal or not is still debatable. Lini is awesome as always, I love gnomes. I also like that this time around the enemy wasn't killed (I don't doubt Lini would off you if needed, I just like a little variety). Great depiction of how druidic casting feels like, too. I think I'm the only one around here who's not in love with the illustrations accompanying these vignettes by Sutter. Different strokes I suppose! ...Okay, maybe Lini is my favorite iconic. I second the interest stemming from Lini not killing her enemy during the scene, especially since this enemy is one that most people of any nominal alignment WOULD kill during the scene if they could -- I guess it's now official that Lini is not a murderhobo. Um, she’s trying to get information out of her. Sure, but Rysky, it's nice sometimes not to have the fight end in death, whatever the reason. I often have enemies escape before the might of my players, or surrender and try to parlay. They in turn know that they can always try a social, more or less peaceful resolution and at least some times it will work.